Black Out or Dim Out lining is for curtain and blind making; contrary to popular belief, “Blackout’ is not necessarily black in colour, but ‘blacks’ out the light. Geek info alert: The process of manufacturing blackout was apparently invented by Baltimore-based Rockland Industries and involves coating a fabric with fine layers of foam, or ‘passes’. 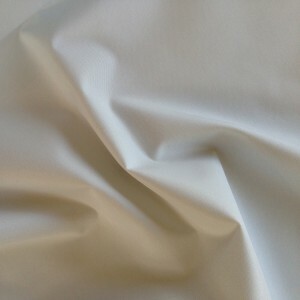 A ‘2-pass’ blackout is produced by applying two passes of foam to a fabric – first, a black layer is applied to the fabric, then a white or light-colored layer is applied on top of the black. A ‘3-pass’ blackout is produced by applying a layer of white foam to the fabric first, then a layer of black foam followed by the third and final layer of white or light-colored foam.